When I was growing up, my school did not do a science fair. I had never been to a science fair until my oldest was in kindergarten. All I knew was it had something to do with baking soda volcanoes. Fast forward several years, and I now organize the science fair and encourage kids to get involved. Through Steve Spangler Science, I also help parents, teachers and students with their projects. Science fair and volcanoes may go hand in hand, but the ever popular demonstration is not actually a science fair project. A science fair project asks a “what if” question, which leads to a variable and eventually finding an answer or at the very least, a big discovery. A science demonstration, like our volcano, is used to illustrate a science concept. Another extremely popular demonstration is quickly taking over the volcano as a classic science fair project – dropping Mentos into Diet Coke. This is also a demonstration. But can you take a demonstration and turn it into a science fair project? Absolutely. All you need to do is C3 it. The three C’s stand for Change, Create and Compare. Find an idea or an experiment that you are interested in, change something, create a new experiment and then compare your results. If your project contains the three C’s, it is a science fair project. We now have our first C – Change. The type of soda will change. That will be our variable. The variable is something that changes in the experiment. Now, we can move on to our second C – Create. Our experiment will test different types of soda with Mentos. Let’s pick root beer, Sprite and regular Coke. We will also have a bottle of Diet Coke as our control. A control is where the variable does not change. We know Diet Coke works and we are testing the other sodas against it. Nothing else in the experiment will change. We will use the same size of soda, same number of Mentos, same temperature, etc. The last C – Compare. As you run your experiment and test the different sodas, note the dependent variable – how high each soda shoots in the air. Which one went the highest? The lowest? How do they each compare to the control’s height? 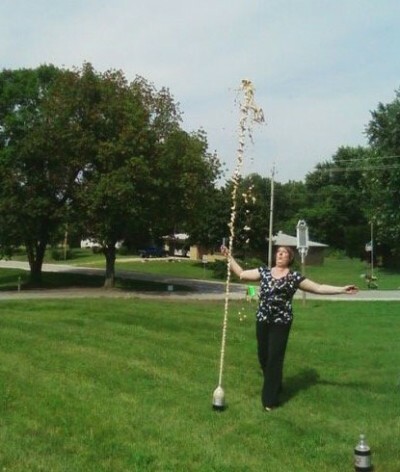 Dropping the Mentos into the Diet Coke and shooting soda all over the science fair is not a project. Applying the three C’s to the demonstration to make a discovery IS a science fair project. You can apply the three C’s to any demonstration to turn it into a project, including the volcanoes. Start with finding one variable to change and you are on your way. For more science fair project ideas, choosing a topic, tips and more please visit our Science Fair section on SteveSpanglerScience.com. Thanks so much for this awesome resource. Keeping true to METS (Make Everyone Teach Science), our public library will be visiting a local middle school next month to talk about our resources AND to help students understand the differences between science fair demoes and projects! Your science fair how-to and C3 have made our talk really fun (and relevant). Thanks a googolplex! Hi Joshua – thank you for taking the time to stop by our blog and write us. You’ve made our day! Your library sounds like a place we’d all like to check out. Good luck with your lesson in science fair next month. Let us know how it goes. Thanks for the great explanation! Very helpful for getting students ready for the science fair here in Maryland. If it is okay, I would love to quote you when explaining what to do in the fair.